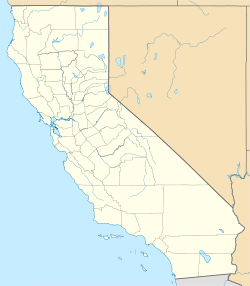 Amboy is an unincorporated community in San Bernardino County, in California's Mojave Desert, west of Needles and east of Ludlow on historic Route 66. It is roughly 60 miles (97 km) northeast of Twentynine Palms. Prior to 2015, the town's business district contained a post office, a historic restaurant-motel, and a Route 66 tourist shop. The town is south of the Granite Mountains, Providence Mountains, and the Mojave National Preserve. Adjacent to the south is the landmark Amboy Crater, and beyond to the southeast the Bullion Mountains. To the south is Bristol Dry Lake and the community of Cadiz, California. Amboy was once a major stop along the famous Route 66 but has seen much lower visitation since the opening of Interstate 40 to the north in 1973. Amboy is home to the famous Roy's Motel and Café, a Route 66 landmark. The town has a total of 10 surviving buildings and a population of far fewer than the advertised 20. According to the Los Angeles Times, the town's population is approximately 4. A resident interviewed in a short 2014 documentary also gives the population as 4, all of whom are men. Amboy is located in ZIP code 92304 and area codes 442 and 760. Although Amboy was first settled in 1858, the town was not established until 1883. Lewis Kingman, a locating engineer for the Atlantic and Pacific Railroad, created the town as the first of a series of alphabetical railroad stations that were to be constructed across the Mojave Desert. In 1926, Amboy became a boom town after the opening of U.S. Route 66. In 1938, Roy's Motel and Café opened, which prospered due to its isolated location on the route. By 1940, Amboy's population had increased to 65. Its growth was tied not only to tourists, but also to the Santa Fe Railroad over which freight trains still run today between Kingman, Arizona and the BNSF Railway Barstow, California yard. During the Great Depression and World War II, tourism declined nationally. But the remaining travelers’ need for lodging, meals and gasoline kept the town busy. The town remained this way until the opening of Interstate 40 in 1973, which bypassed Amboy. Two extinct volcanoes are located to the west of Amboy: Amboy Crater is a 6,000-year-old cinder cone volcano, made largely of pahoehoe lava, and Pisgah Crater, also a cinder cone volcano, is located near Interstate 40. Because of quarry operations, the crater is not as well preserved as Amboy Crater. Roy's Motel and Café was the only gasoline, food and lodging stop for miles around that part of the eastern Mojave and was well known for both its Googie "retro-future" architecture added to one of the original buildings and even more famous sign, a 1959 addition. Both Roy's and the surrounding town were once owned by Buster Burris, one of Route 66's most famous characters who purchased Roy's from his father-in-law Roy Crowl, the man for whom the property is named, in 1938 and ran the town until 1995. In 1938 Roy Crowl opened "Roy's" as a service station on Route 66 in Amboy. Roy, together with his wife Velma, owned the town. In the 1940s Roy teamed up with Herman "Buster" Burris who married his daughter Betty. Together they expanded the business, keeping it open 24 hours a day and adding the motel to the service station and café. Business boomed in the deluge of motor tourists after World War II. The routing of the old National Trails Highway (1914) and its better-traveled successor, Route 66 through Amboy saw a steady growth of business, especially at Roy's. The complex was so busy during summer vacation that Burris placed classified ads in other states to bring in employees. Buster sold the town in 1995, and moved to Twentynine Palms where he died in 2000. The town was owned by investors Walt Wilson and Tim White who mainly used it for photo shots and to host movie companies. After the two lost it in foreclosure, it was repossessed by Bessie Burris, Buster's widow. Bessie sold the property in February 2005 to Albert Okura, owner of the Juan Pollo restaurant chain, who offered $425,000 in cash and promised to preserve the town and reopen Roy's. The deal included about 490 acres, including the town as well as Amboy and Route 66 landmark Roy’s Motel and Café, the church, post office, three gas pumps, two dirt airstrips and other buildings in the town. Okura also plans to open a museum, much like he has with the original McDonald’s location in San Bernardino, turning it into an unofficial museum. Okura reportedly got the idea of buying a town from the real estate agent who sold him his first home, who shared that he regretted not buying a town when he had the opportunity and recounts the story in his book, Albert Okura: The Chicken Man with a 50 Year Plan. Unlike Timothy White and Walt Wilson, who bought (and later defaulted on) the town and Roy’s Motel and Cafe prior to Okura’s purchase and marketed the town as a ghost-town location for film and television productions, Okura plans on restoring the town for Route 66 tourists and sees the purchase of the town as part of his "destiny". On April 28, 2008, Roy's reopened. The renovations and repairs cost $100,000. Albert Okura also planned to open a café and mini-mart at the same location; as of 2014, the restaurant remains closed for lack of an adequate potable water supply. As of 2015 the motel is closed as well. A gift shop is open in the café, and gas is available on request. The motel has been used as a stage for art exhibits. Roy's has attracted some well-known regulars. Actors Harrison Ford and Anthony Hopkins have autographed photos on the walls of the restaurant and visit whenever their schedules allow. Ford frequently flies in and lands his plane on a nearby landing strip, one of the first ever built in California. A palo verde tree east of Roy's on Route 66 was formerly used as a shoe tree but collapsed in 2010. Part of the 1986 motion picture The Hitcher with Rutger Hauer was filmed in Amboy while Roy's was the setting for a 1999 television commercial for Qwest Communications. It was also used in Enrique Iglesias' music video "Hero" and the film Live Evil. Owners Wilson and White maintained Amboy in weathered, unrestored condition for use as a motion picture film site. A large portion of the 2010 movie Beneath the Dark was filmed in Amboy. In 1993, Huell Howser visited Amboy during episode 410 of California's Gold as part of his ongoing series visiting interesting areas of California. During the episode, he interviewed Buster Burris, the owner of Roy's. The episode was aired on December 3, 1993, and also showed Wonder Valley in the Morongo Basin and the Amboy Crater. Enrique Iglesias filmed segments of the music video for the 2001 hit single "Hero" in Amboy. ^ a b c d e f Mike Anton, Destiny in the desert, Los Angeles Times, January 17, 2007. ^ Coulson, James. "Other America: Population Four". Other America. Retrieved 21 January 2015. ^ a b "A look at Juan Pollo founder Albert Okura's success, big dreams". San Bernardino Sun. Retrieved August 24, 2014. Wikimedia Commons has media related to Amboy, California.